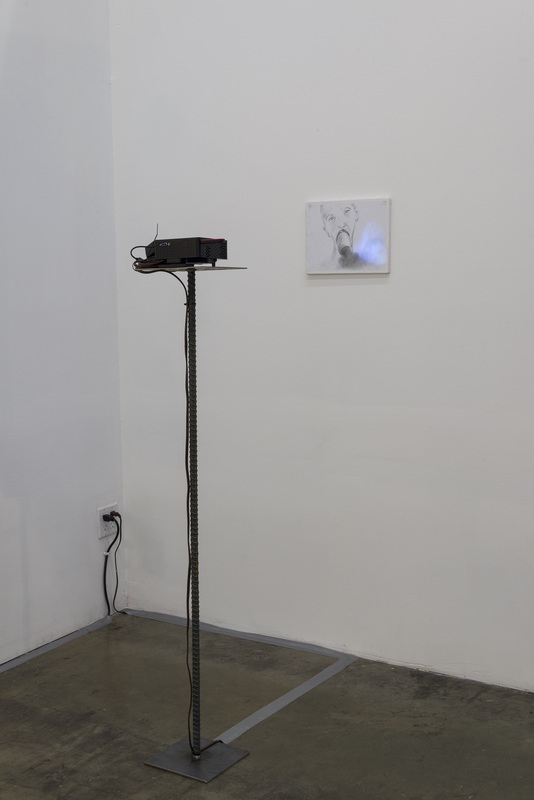 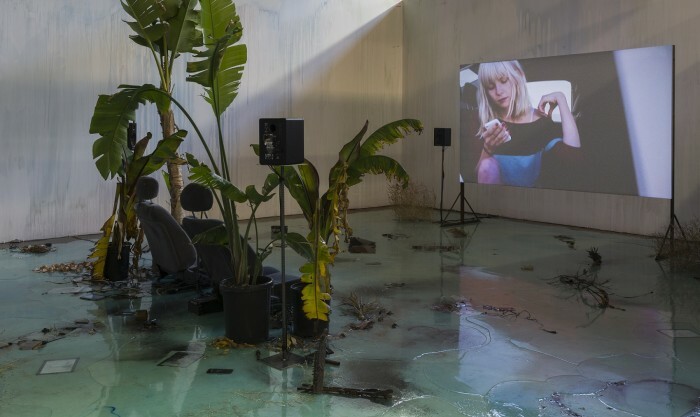 A Way to Leak, Lick, Leek is the outcome of Prouvost’s residency at Fahrenheit completed in the spring of 2015, and is the counterpart of the artist’s project presented last year at Musée départemental d’art contemporain de Rochechouart in France. 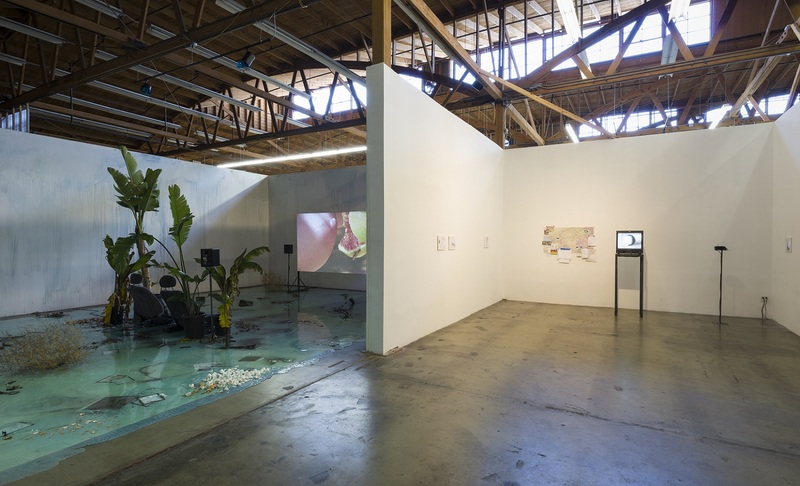 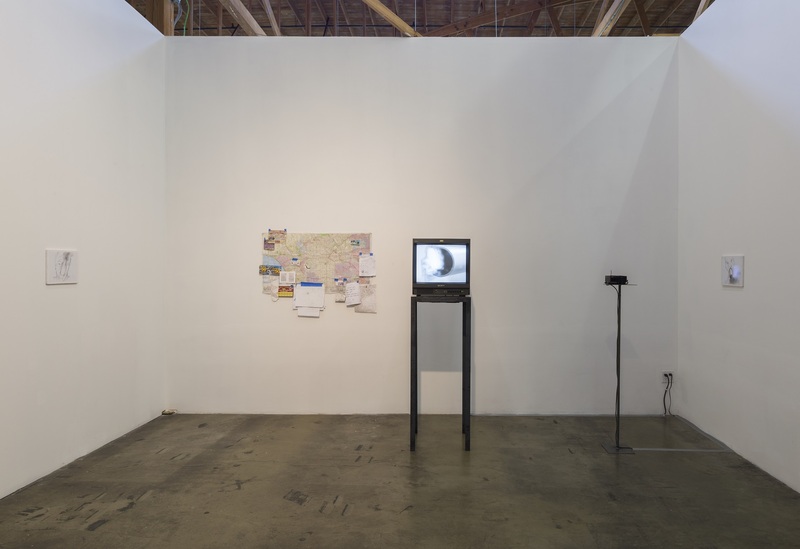 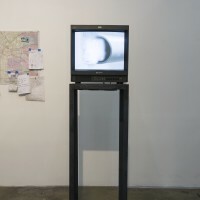 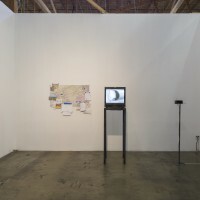 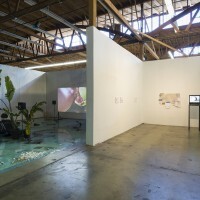 The exhibition results in a site-specific installation of films, sculptures, and drawings utilizing elemental material found within Los Angeles —flora, fauna, smells, sounds, abandoned objects, and the vertiginous light of L.A.
Laure Prouvost constructs an immersive environment in which her works become central ploys in a scenario that explores the boundaries of fantastic and urban escapism. 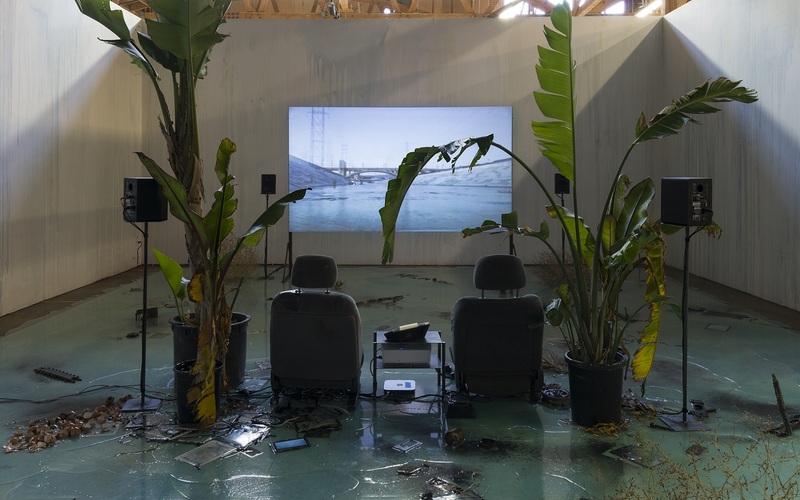 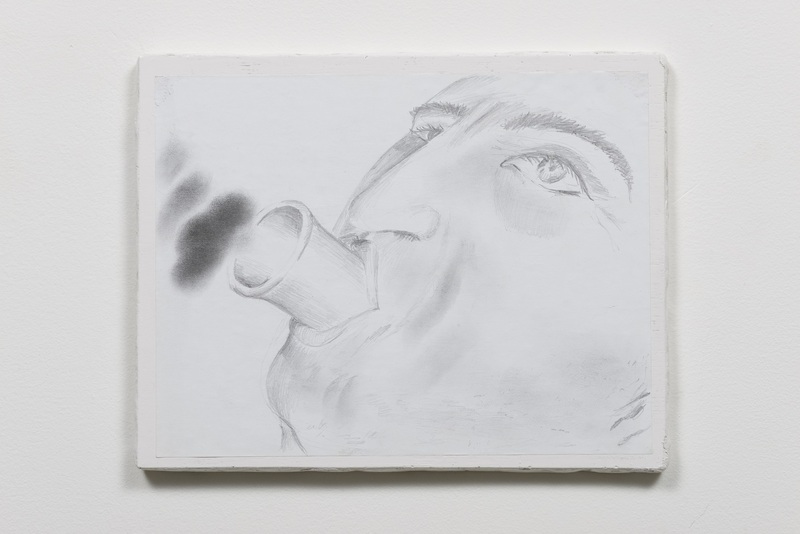 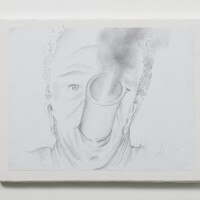 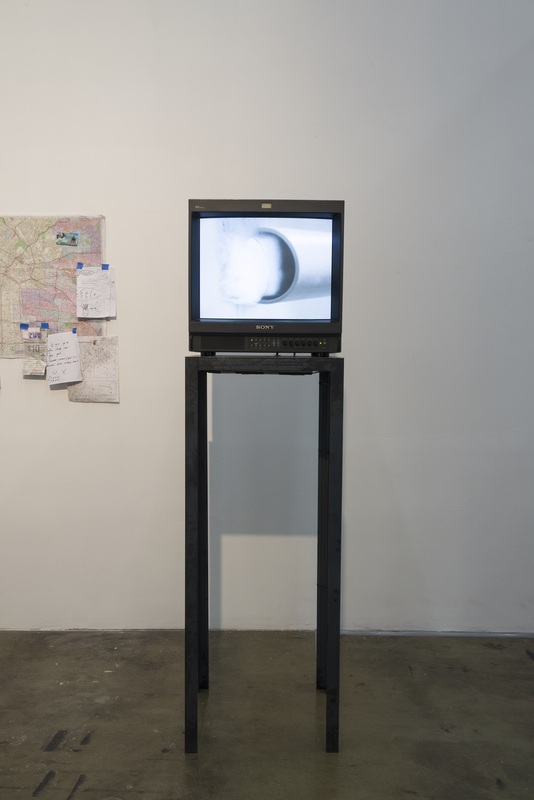 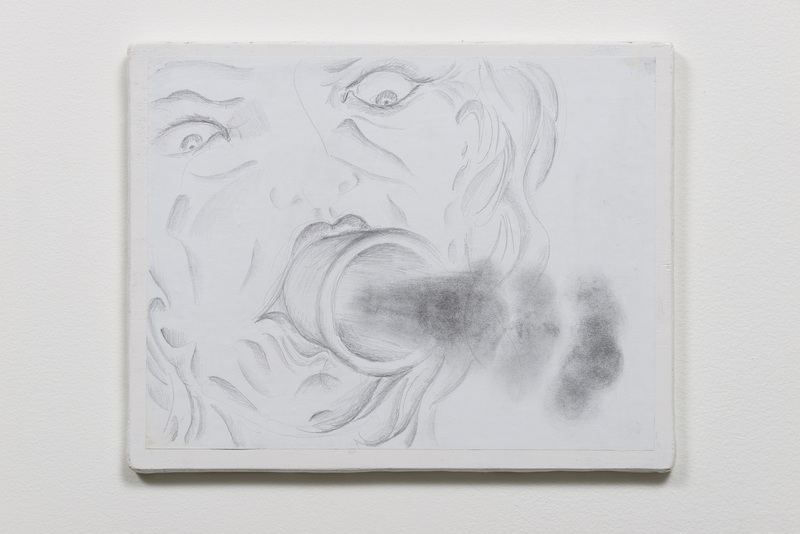 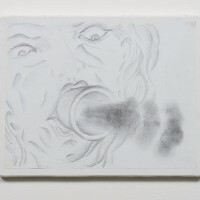 Her series of drawings and films reflect a delineated urban experience made of driving in L.A. and breathing in petrol and plastic smells. 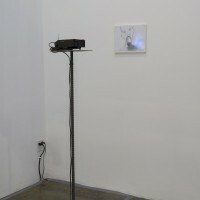 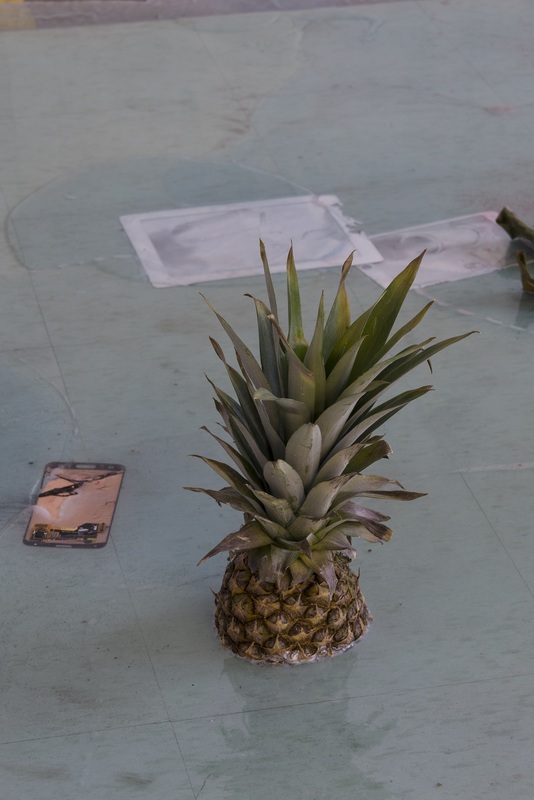 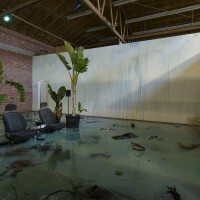 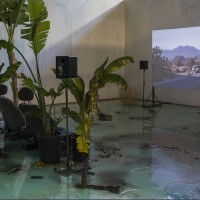 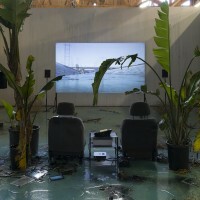 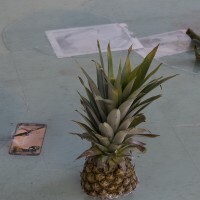 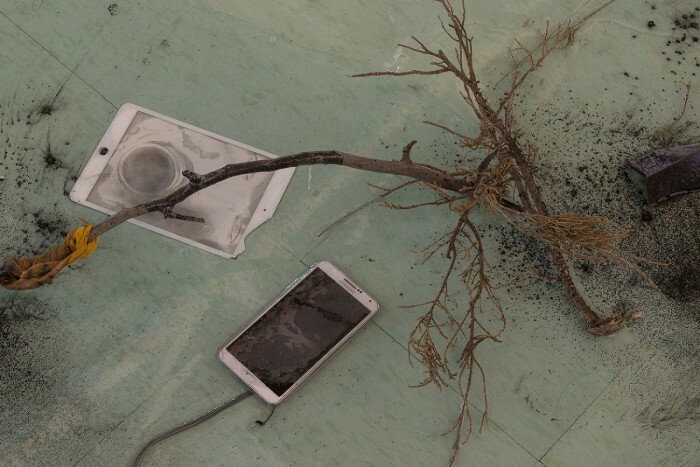 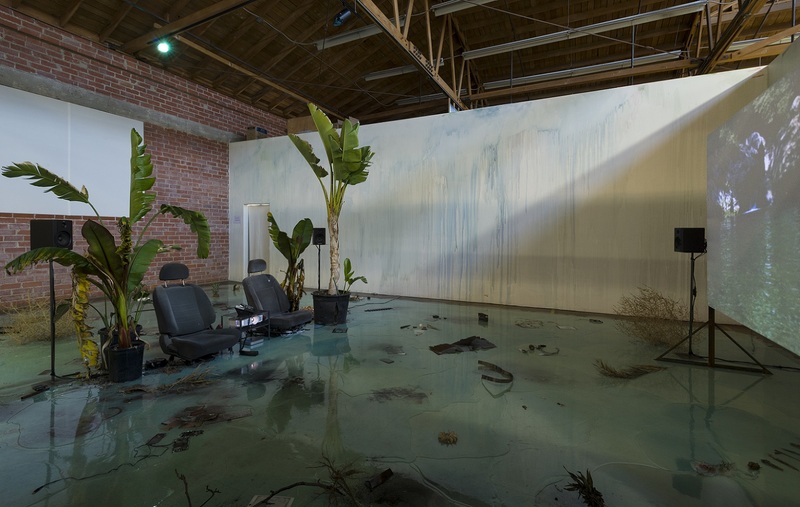 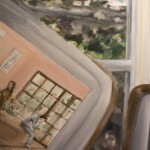 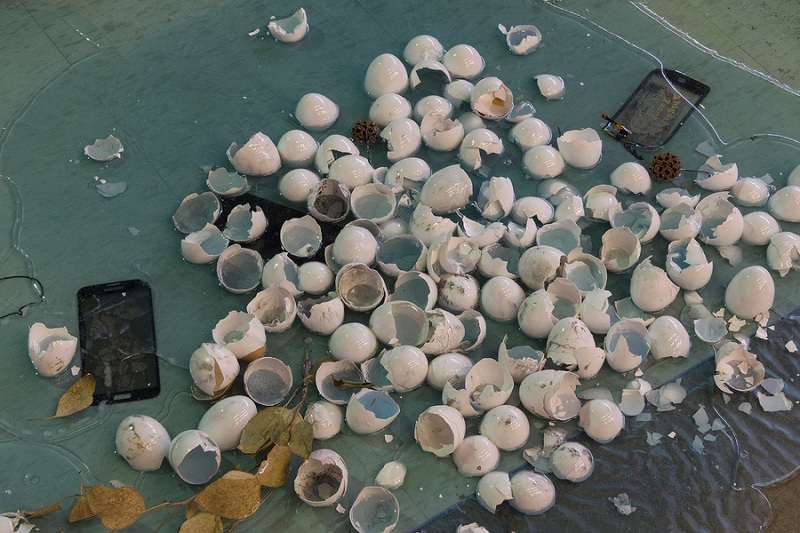 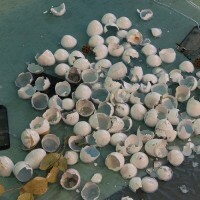 For her main installation, Prouvost coated the floor of the gallery space with blue resin, ornamenting its surface with shattered technological junk, abandoned tropical trees, floating pineapples, and branches of tumble weeds —an apocalyptic vision reminiscent of a private pool the morning after a wild night. 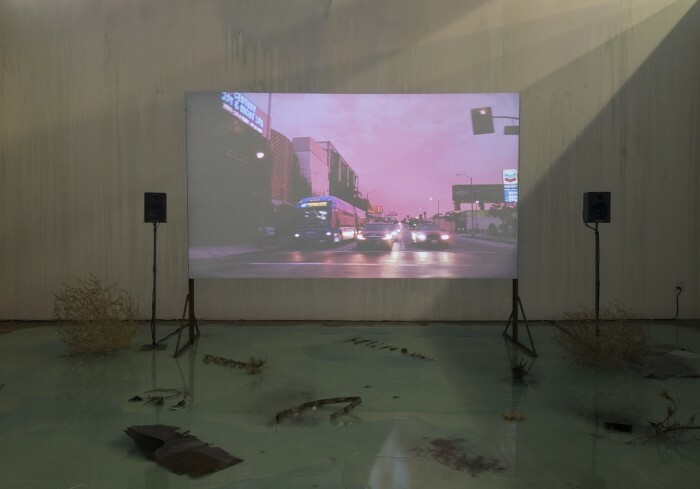 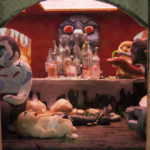 In her new video, Lick in The Past , filmed last spring in Downtown Los Angeles, she employs tropes both derived from and challenging the filmic languages of cinema and art. 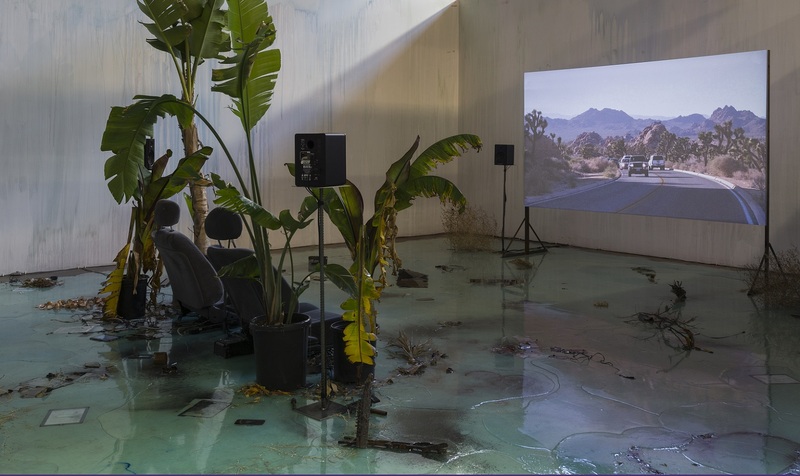 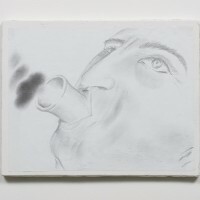 Adolescent Angelinos and their collective performance constitute an amateur form on an improvisational level, acting in a parking lot to the sound of an original hip-hop track specially composed by L.A.-based producer WYNN for the exhibition. 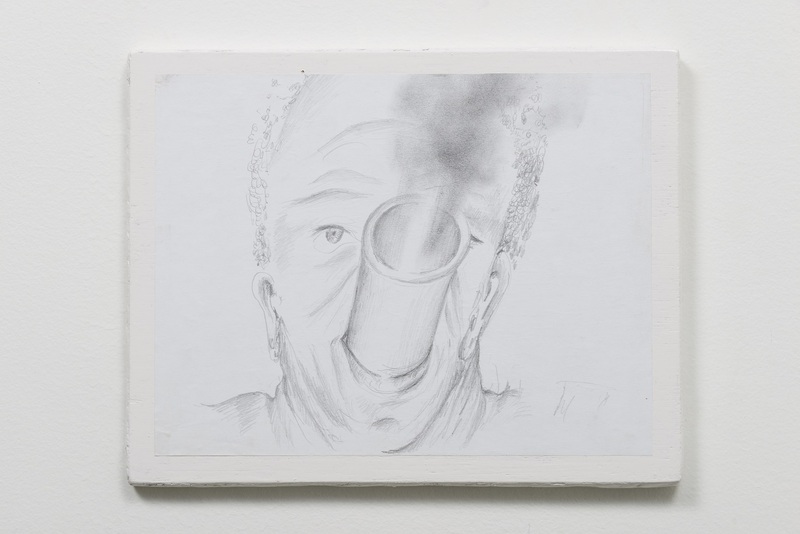 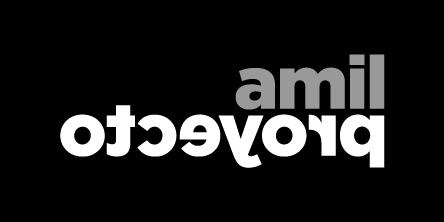 These stars of the outtake bring corrupt reveries to life through humor and mistranslations.